(Business Insider) Russia and Iran are aligning more and more. 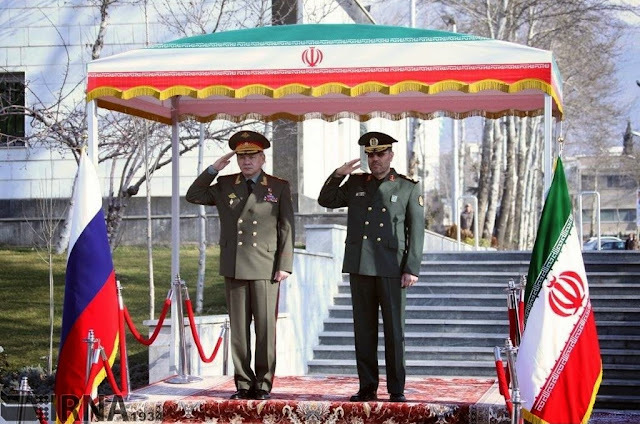 In Tehran on Tuesday, Russian defense minister Sergei Shoigu and his Iranian counterpart, defense minister Hossein Dehghan, signed an agreement on "military cooperation" between the two countries, according to the state-controlled news agency TASS. The two defense ministers also discussed "activities of mutual interest," including the expansion of delegations, the holding of staff talks, participation in exercises as observers, the training of military personnel, and the exchange of experience in peacekeeping and counterterrorism, TASS reports. "We have agreed to expand the practice of visits of warships in Russian and Iranian ports," Shoigu added. Additionally, the Iranian defense ministry said the two countries decided to settle "the S-300s problem," according to Naharnet. "A step was taken in the direction of cooperation on the economy and arms technology, at least such defensive systems such as the S-300 and S-400. Probably we will deliver them," RIA quoted Colonel General Leonid Ivashov as saying. Back in 2007, Russia signed a contract to sell S-300 air defense systems to Tehran, but following strong objections by the US and Israel, the missile system was never delivered. Israel has also urged Russia to refrain from selling the advanced weapons system to the Syrian regime.